The origins of this chili are to be found in Central America and more precisely in the district of Moruga state Trinidad and Tobago (Caribbean islands). This Moruga, probably, is a cross between a Trinidad Scorpion simple and some other varieties always extremely spicy. 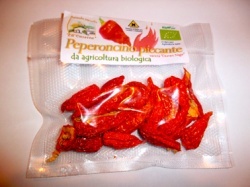 The fruits of Moruga have a flavor and very spicy scent of tropical fruit, have a level of spicy really extreme. The Moruga was considered the hottest on the planet Earth until 2013 because, in some measurements of spicy, touched 2,000,000 Scoville degrees even though the average of the measurements amounted to 1,207,764 SHU degrees. 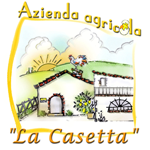 Cultivated at "La Casetta" harvested and immediately cleaned, washed and dried. The drying takes place by air flow dryer at 30/35 ° C. According to italian HACCP standards. No sun and no dust! Dried and packed in a plastic bag of g. 10.